The sixth in a 10-part cycle of plays, Fences examines the lot of the African-American male in late-20th century USA by observing the life of a working-class Pittsburgh family in the 1950s. Playing a fairly unlikeable character, Troy Maxson, Denzel Washington has been nominated for a Best Actor award at this year’s Academy Awards for the role. It’s a tight race and it will be interesting to see if he gets the gong for his performance as a tyrannical garbo, a man who lords it over his wife and sons and who justifies it because he provides a roof over their heads and puts food on their table. In Troy’s world view, that allows him to do pretty well whatever he damn pleases. Also nominated (for Best Actress in a Supporting Role) is Viola Davis as Rose, his long-suffering wife who keeps a lid on the potentially explosive household and retires to her kitchen and household chores with grace and acceptance. This is the ‘50s, after all, when women generally were victims of subjugation and whose voices were seldom heard. Troy is an angry man, for his dream of becoming a baseball star was thwarted through racism, he believes, although Rose maintains it was because he was too old by the time Major League Baseball was desegregated. He takes his frustrations out on those around him, particularly his sons Cory (Jovan Adepo), who’s been invited to take up a college scholarship as a football player, and Lyons (Russell Hornsby), who he regards as a failure because he chose the life of a musician. Troy spends his Friday nights throwing back neat gin while bitchin' with his long-time workmate Jim Bono (Stephen McKinley Henderson). Bono is his sounding board and conscience but he’s not often listened to by Troy, who’s a full-on bully when he gets worked up… and he gets worked up a lot. When a hidden truth emerges, emotions flow and you become immersed in Troy’s world of misery from which there’s little chance of escape, at least for Rose. It can be hard to empathise with Troy though, because it’s a world that’s largely of his own creation. Despite that, you leave the cinema feeling drained, even if the experience is more theatrical than cinematic because most of the action takes place in a mere handful of locations. Admittedly, the camera does try to break out through some restless movement and crane shots but it’s not enough to disguise the film’s dramatic origins. Nevertheless, it’s worth it to see an ensemble of fine actors display their skills. 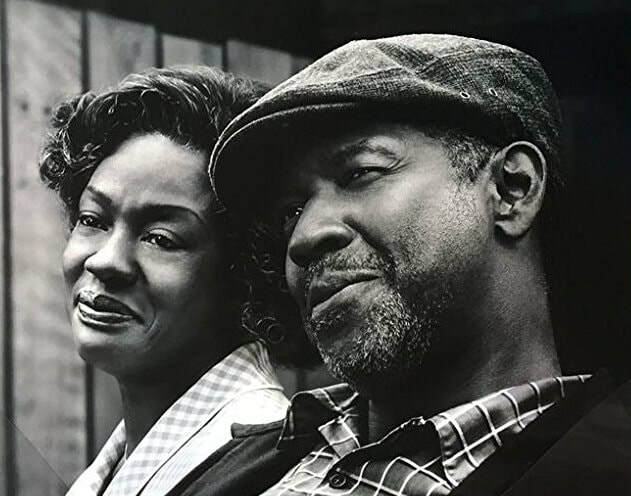 The Pulitzer and Tony Award-winning playwright of Fences, August Wilson, also wrote the film’s screenplay and his script has been nominated for an Oscar, as has the film itself, for Best Picture.